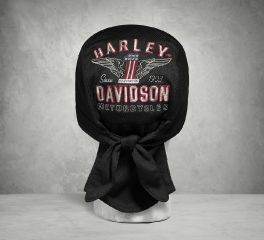 Functional plus versatility and style equals to Harley-Davidson® skull caps. Nothing is better than having an enough warmth to cold weather days. This men's skull cap offers excellent wicking construction to capture moisture and move it away from your skin. The Performance Winged Logo Knit Skull Cap dries fast so you can stay cool and keep going. The Performance Winged #1 Knit Skull Cap drives home comfort thanks to the mesh wicking fabrication that helps keep you cool and dry. Classic style, too. Check out the iconic embroidered graphics on this men's skull cap. Sized to fit most. We construct ourFlames Quick Dry Skull Cap from lightweight mesh so it's ideal in warm weather. It includes back ties for an easy fit and features classic graphics to capture the spirit of the ride. Our men's skull cap is a no-brainer for warm-weather adventures. Skull caps are an iconic biker symbol. Pioneers of the trend, H-D® continues pushing the limits by creating styles that are always a little edgier than the last.